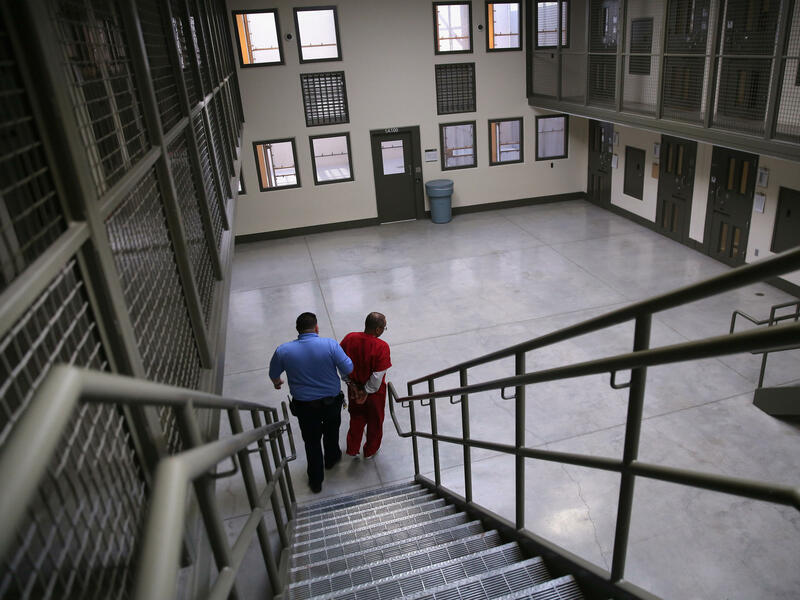 A guard escorts a detained immigrant from his "segregation cell" back into the general population at the Adelanto Detention Facility in November 2013. Today the privately run ICE facility in Adelanto, Calif., houses nearly 2,000 men and women and has come under sharp criticism by the California attorney general and other investigators for health and safety problems. 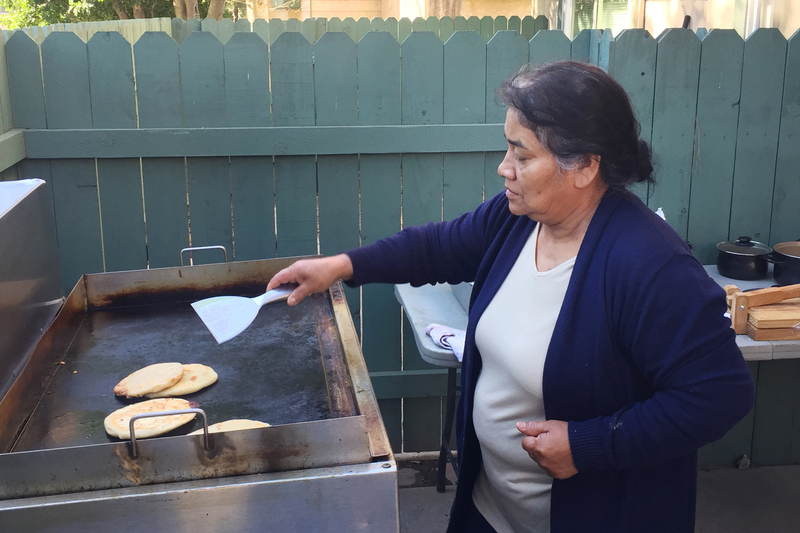 Maria Contreras, José's sister, makes papusas and other food for sale in Southern California — to help support the family while José is in detention at the ICE Adelanto Processing Center. He has been held there for months without his glasses or requested counseling for depression, she says, and doesn't get his diabetes medication when he needs it. José Contreras with his family, in happier times. He came to the U.S. from Guatemala without authorization more than two decades ago and worked in construction until agents picked him up and took him to Adelanto. Today, President Trump put forth a new idea for how to deal with overflowing immigrant detention centers - send detainees to so-called sanctuary cities. Let's take a moment to look at the conditions for detainees in one of those facilities - the Adelanto ICE Processing Center. It's a prison-like facility north of San Bernardino, Calif. A disability rights group says it's failing to provide adequate mental health care to detainees. Reporter Sarah Varney tells us more. And just a warning - this story contains mention of suicide. VARNEY: ...Then a local bank. VARNEY: Giselle's father crossed illegally from Guatemala 25 years ago. He worked in construction until agents picked him up and brought him to Adelanto. 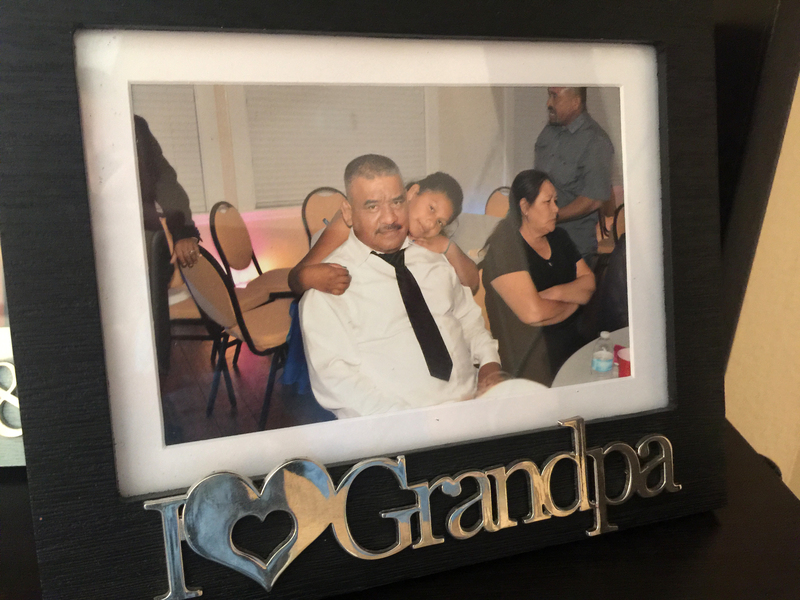 Giselle says her father languished there for three months without his diabetes medication. Now the guards give it to him at odd times during the day and night. She says ICE agents took his eyeglasses, so he can't read legal documents or write letters. GISELLE: My aunt tried to take in glasses for him. But they don't allow for us to give them anything. They tell us that they give them everything that they need. VARNEY: And does your dad have glasses now? VARNEY: Her father is terrified of being deported. And she says the regimented world inside Adelanto is driving him into a deep depression. GISELLE: His conversations now have become shorter. He doesn't talk to us I ask, like, how's your day? How you been? He's always looking down at the ground because he just doesn't want to make eye contact for the same reason that he's just so depressed. VARNEY: Jose's sister, Maria Contreras, visits her brother every Saturday. She urged him to see a psychologist at Adelanto. But the only thing they tell him, she says, is that he has to wait, or he has to fill out a paper. And he fills out the paper, but he doesn't get any help - no response or anything. Adelanto sits on a desolate stretch of road in the high desert. About 2,000 men and women are held here. Some arrived recently during the surge in border crossings. Others lived in the U.S., undocumented and undetected for years. In the visiting room, where detainees are brought in wearing blue, orange or red baggy pants and tops, a sign on the wall reads, don't give up hope. The facility, run by GEO Group, has a troubled past. Federal and state inspectors have found detainees are treated like prisoners, even though they haven't been charged with a crime. And they don't receive adequate medical or mental health care. The alleged cases documented in the most recent report by Disability Rights California are grim - detainees slitting their wrists, discontinued medication for depression and ignoring requests for wheelchairs and walkers. In a statement, GEO Group says it strongly disputes the claims in the report and that the remedies recommended by Disability Rights California were already in place. We are deeply committed, the statement reads, to delivering high-quality, culturally responsive services in safe and humane environments. An ICE spokesperson said GEO Group's Adelanto facility is in full compliance with the Americans with Disabilities Act. Mario was inside Adelanto for six months in 2018. He says the report describes his own experiences there. MARIO: What's happening is, like, all those claims that have been made against GEO and the staff in the medical department are finally being backed up by reports. VARNEY: Mario asked us not to use his last name, since he's out on bond and still fighting deportation. He's 32 and crossed illegally with his parents when he was 5. In 2017, he was convicted of a misdemeanor. And ICE agents picked him up at his home in Ontario, Calif. At the time, he was seeing a therapist for depression and taking medication. It took three weeks to get his antidepressants back. And he says the sessions with the psychologists at Adelanto were brief and cursory. MARIO: They keep their actual sessions to, like, a 5- to 10-minute maximum. And 10 minutes is, like, pushing it. And it's basically just like a quick check-in. They just ask you, like, how are you? Do you have any suicidal thoughts? Like, when is your next court date? So it's super minimal, almost nonexistent. It's one of those things that I feel that basically is just done to say, all right. We did it. VARNEY: Mario is gay and lived in a room with three other men, including a gay man from Mexico who was seeking asylum. The men became close friends. MARIO: He was persecuted in Mexico because of being gay. And so he already came with all this trauma. You know, and being detained for - at that point, like, four months and not really getting any mental health care really took a toll on him. And that's when he cut his wrist with a razor blade from the razors that we get to shave. And after that, he was placed in solitary confinement for about a week. VARNEY: Mario says when his friend came back to their room, he was taking some sort of medication. MARIO: After that, all he did was sleep. Like, whenever the food was ready, I'd go call him, like, hey, wake up. It's time to eat. VARNEY: I heard this from other detainees and immigration lawyers - that the GEO psychiatrists prescribe antipsychotic medications that make people sleep much of the time. It's one of the reasons, Mario said, people were reluctant to seek help. But also, like other detainees, he was worried about being labeled as depressed. MARIO: I couldn't express whenever I was extremely feeling sad or depressed or anxious because I was afraid that that would be used against me in court. VARNEY: Judges cannot use mental health conditions to deny legal status, say immigration attorneys. On the day I visited Adelanto, long after GEO Group says it fixed any problems, there was a hunger strike. The detainees gave an attorney a handwritten note. And an advocacy group gave me a copy. Chief among their demands was speedier access to good medical care. I'm Sarah Varney in Adelanto, Calif. Transcript provided by NPR, Copyright NPR.